Some time ago I made a Sukkot guest book, so we could remember who shared our sukkah each year. It was a hit with my family, so this year we decided to extend the idea and make a Passover guestbook, to record who came to our Seder and all the other things that would blur as years go by. I designed the book myself using photobook software, and it has been commercially printed. On each double page, one side has spaces for the date and location, who came, what we ate and any special things we want to remember from that evening. On the other pages, I have included such things as a list of memorable moments from seders past, the evolution of our bespoke Haggadah, some alternative questions (with space to add more), a favourite recipe and space for future menu suggestions, a list of things we’ve made especially for Pesach (from placemats to Moses & Pharaoh figurines), and space to list any new traditions we develop or things we want to remember for the following year. Last year my daughter was four, old enough to stay awake for our Passover Seder, but not quite old enough to sing the four questions, the role traditionally assigned to the youngest child. Instead, she was delighted to score what seemed to her to be the best job in the world: Chief Frog Wrangler. However, frogs alone do not constitute ten plagues, so I set about trying to concoct something visual for the other nine. And once we had the plagues, we needed someone to inflict them on. I have recently discovered that you can obtain actual figurines of Moses and Pharaoh, but not from anywhere near where we live. 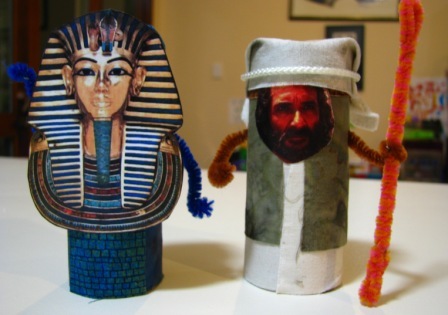 Thus it came to pass that Moses and Pharaoh were created from cardboard tubes and pipecleaners, and they made our Seder so much fun that we have booked them to appear again this year. 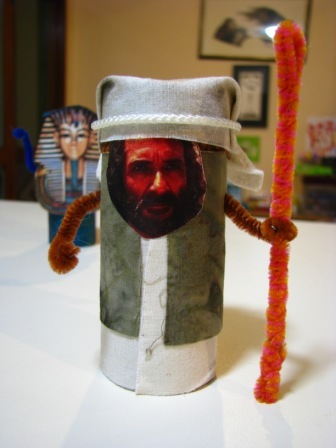 Initially this was going to be a Passover craft for my Shabbat Tot group and I found instructions for making a cardboard Moses on the internet. My first effort was decorated by my daughter, who may have been subconsciously channelling Joseph and his Technicolour Dream Coat. 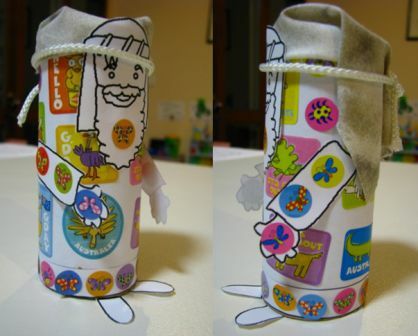 So I decided to dress Moses up more elegantly, by glueing some fabric scraps to the outside of the cardboard tube rather than using paper. At this point I realised that the paper arms would not really match the new look, so I ditched them in favour of threading through a pipecleaner. I also decided I wanted a less cartoon-like face, so I used google images to search for a more realistic (?) version of Moses. This returned way too many photos of Charlton Heston, but eventually I found one of the very talented Ben Kingsley. For Pharaoh I also wrapped fabric around a cardboard tube and inserted pipecleaner arms. For his head I attached a picture of King Tut. (I know this is actually his death mask, but seriously, how much more Pharaoh-y could you get?) 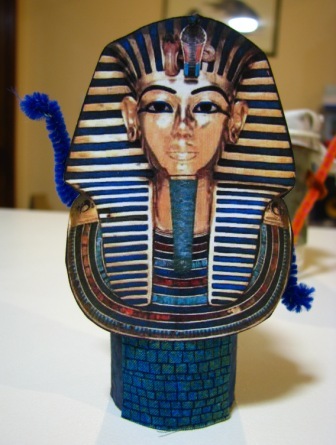 The finishing touch was bending his arms so that he is “walking like an Egyptian”. Personally I think he looks awesome! Bwa-ha-ha, I think NOT, Moses! So, last Seder Moses and Pharaoh battled it out, and my daughter had a great time showering down plagues of hail/locusts/frogs etc. 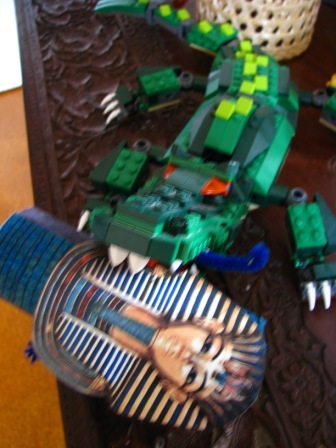 Then a few days later I discovered she had fed him to a lego crocodile for good measure. That’ll teach him to be mean to us! 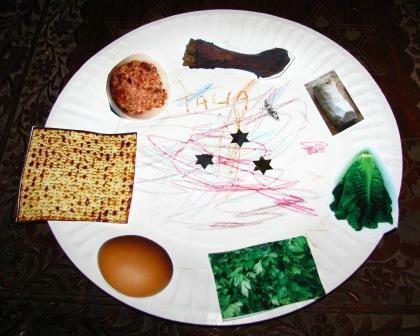 This is a very easy way to introduce the main elements of the Seder to your young children without any food getting into the carpet! 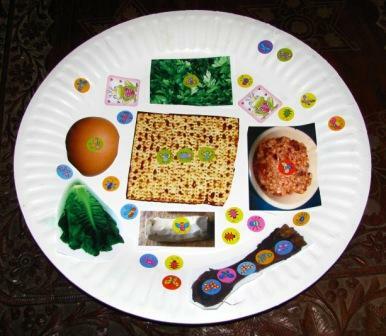 – pictures of the ceremonial foods placed on the seder plate. 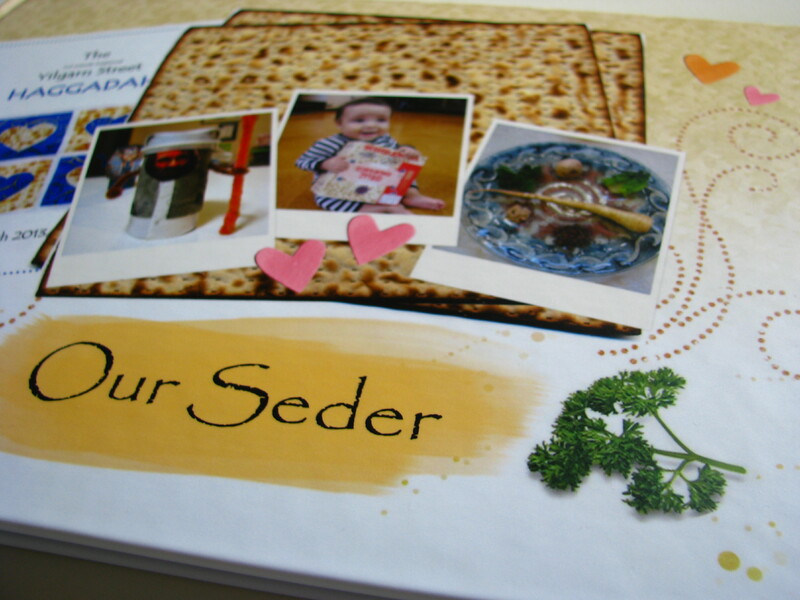 If you don’t have time to find your own, you are welcome to print out the pictures I used of of Seder plate foods and matzah (all found via google images). 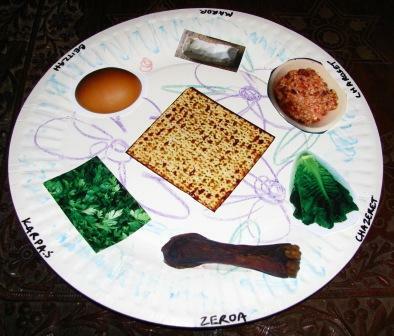 I included matzah as it’s the main event in this festival, even though it doesn’t actually sit on a real seder plate. Have fun! Here’s the plate my daughter made last year (aged 3). When I decided to do the same activity again this year, she immediately made herself another one (this time doing all the cutting out by herself) and then decorated it extensively with bug stickers. We are going to have so much fun this Pesach! !